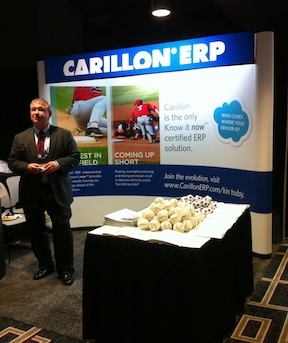 It was Carillon ERP’s first time participating in the Midsize Enterprise Summit. Gartner, the foremost authority on technology research, was a collaborator at the Summit. Held in the historic city of New Orleans, the event was filled with great content sessions on measuring the flow of information, the future of cloud, and research on CIO interests. It was refreshing to hear so much of the content supported Know it now Management. Larry and I were pleased to meet all of the attendees. We look forward to seeing you at the next Summit in San Antonio on September 12th. To register for this exclusive event…go to Xchange event’s website and click on the “Attend” button. Carillon ERP also attended the New Jersey Accounting, Business, and Technology Show in Secaucus, New Jersey last month. We met many friendly CPA’s who expressed interest in our nationwide Authorized Consultant Program. We still have seats available for our July training session so contact us as soon as possible to schedule. Members of our Authorized Consultant Program enjoy more than a referral fee; they receive direct phone support for all software, implementation, and even sales issues, the opportunity to bill at much higher “implementation” rates, free software updates, and much more. For the full list of benefits and restrictions, visit our Authorized Consultant page. Next stop: Rosemont Illinois for the Midwest Accounting and Finance Showcase. We look forward to meeting CPA’s from all over Illinois. We will update our trade show page with free exhibit hall passes next month so check back soon!